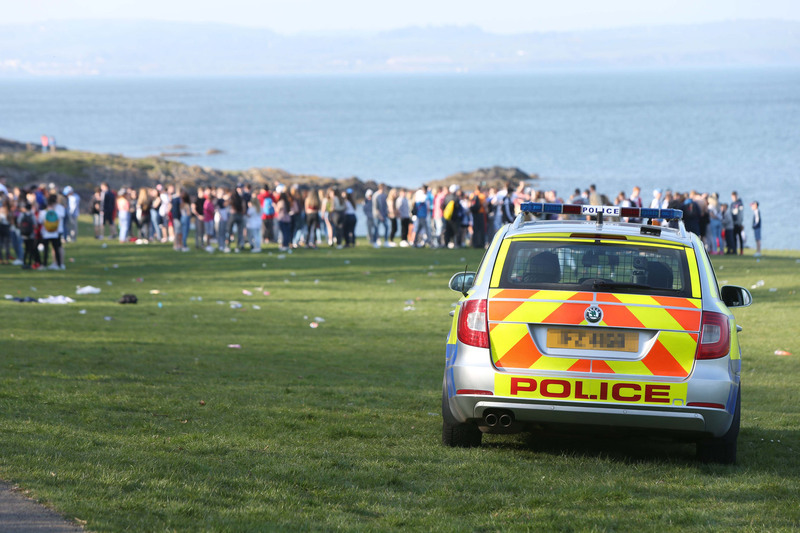 Police respond to reports of underage drinking in Crawfordsburn Park in 2015. Picture credit Press Eye. HUNDREDS of young people are being hospitalised, ending up in custody or are receiving long-term care as a result of problem alcohol use each year in Northern Ireland. These are some of the key findings of a special Detail Data report into underage drinking. A leading charity has confirmed it is working with hundreds of children, some as young as 13, who are struggling with the impact of alcohol on their lives. Despite this level of alcohol abuse among young people, the number of PSNI seizures from underage drinkers more than halved from 723 to 320 in the ten months following the establishment of 11 new police districts in 2015. Campaigners are calling for the introduction of minimum pricing, compulsory support services at major events, greater transparency in relation to the publication of licensing information and the allocation of more police resources towards tackling the problem. Before the Assembly election on March 2, Health Minister Michelle O'Neill told Detail Data that she planned to put proposals for the minimum pricing of alcohol out to public consultation: "As soon as possible." Under 18s have been admitted to hospital on 655 occasions with alcohol related conditions in the past five years. These figures exclude those presenting at accident and emergency units. The PSNI seized alcohol from under 18s on 1,161 occasions in the past two years. This included seizures from children as young as 12. The number of off-licences, including those at supermarkets, has increased by nearly 60% since 1999. However, anyone hoping to secure a list of all licensed premises faces a convoluted process and a bill of over £1,000. Marie Wright of Start 360, an organisation that provides support services to young people, adult offenders and families, said: “We are working with people as young as 13 who are experimenting with alcohol and other drugs. “We are seeing hundreds of young people a year who are really struggling with the impact of alcohol. “Young people do present to emergency rooms under the influence of alcohol. We know from medical experts that young people who are abusing alcohol are showing signs of liver damage, kidney damage and other serious physical conditions. “If they have become dependent, their physical health will deteriorate, their eating will be an issue, their sleeping will be an issue and their mental health. SOS NI is a charity based on Christian beliefs that offers a mobile bus based service where trained volunteers and medical staff help people in crisis when socialising at night. According to Joe Hyland, the chief executive of SOS NI, some young people are drinking huge amounts. “At a recent event we had three youngsters, one aged 13, who drank a 10 glass bottle of vodka and their life was seriously under threat,” he said. In addition to coming to the attention of services such as SOS NI, Detail Data has found that, on average,more than 130 young people are being admitted into acute hospitals each year for alcohol related conditions. In response to a Freedom of Information request the Department of Health (DOH) confirmed that between 2010 and 2015 there were 655 admissions of under 18s to acute hospitals with alcohol-related conditions. 2014/15 saw more admissions than any of the other years, with 140 admissions. Figures for 2015/16, the period in which the PSNI seizures dropped so dramatically are not currently available. The Department of Health (DOH) said alcohol related admissions are recorded in 34 categories. These range from acute intoxication to liver disease, degeneration of nervous system, psychotic disorders, delirium and self-poisoning. 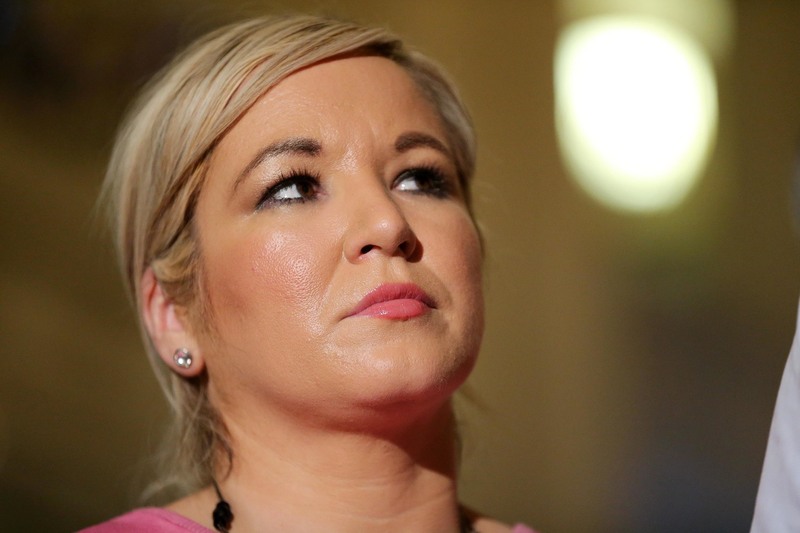 In response to the figures, former health minister Michelle O’Neill said many more young people are having health problems as a result of problem drinking. “Alcohol misuse is a significant public health risk at any age, but young people are particularly at risk from physical and mental consequences of excessive alcohol consumption,” she said. “While 655 young people were admitted to hospital with alcohol related issues, many more are likely to have attended our emergency departments. Former Health Minister Michelle O'Neill. Picture credit Press Eye. “Clearly this is worrying. This Department leads on the cross-departmental strategy to prevent and address the harm related to alcohol and drug misuse in the north. "This strategy places young people as a priority group and contains a range of actions to reduce their access to alcohol and drugs, and puts in place a range of services to reduce demand that include education, awareness and information; early intervention; harm reduction; treatment and support. These figures come from analysis of the Young Persons Behaviour and Attitude Survey. The 2014 drug and alcohol census stated that more than 500 under 18s were receiving treatment for alcohol abuse from a range of services. The latest census was conducted on March 1, 2017, with the Department of Health stating that: "Results will be published as soon as possible." In the 2014 census it was stated that 327 under 18s were receiving treatment for alcohol issues, with an additional 192 receiving treatment for drug and alcohol problems. Of these 519 youths, the vast majority (482) were receiving treatment from non-statutory organisations. All treatments for under 18s, in both statutory and non-statutory settings, were non-residential. The link between underage alcohol abuse and offending can also be seen in a high proportion of cases where a young person is held in custody. In a statement issued to Detail Data the Youth Justice Agency said: “Alcohol misuse does play a part in offending by young people - however alcohol misuse is invariably linked with drug misuse. Marie Wright of Start 360 said alcohol has been a problem for the majority of young people in the juvenile justice system. Among the programmes delivered by Start 360 is DAISY (Drugs and Alcohol Intervention Service for Youth) which aims to help young people reduce the harm caused by their substance misuse. “A Queen's University Belfast evaluation report from 2005 found that nearly two thirds of participants (63%) admitted that their alcohol use was one of the reasons why they were in [Hydebank young offenders centre]. This is still very much reflected in our own experience in the years since then,” Ms Wright said. “We work in the Juvenile Justice Centre at Woodlands, we also work in Hydebank. I would say the majority of young people who end up in custody, drugs and or alcohol are a feature. Probably in at least 90% of the cases. “In DAISY we work with young people who are most at risk. Those young people whose drug and alcohol use has brought them to the attention of the PSNI or other services. Social Services may also be involved with the family as well. 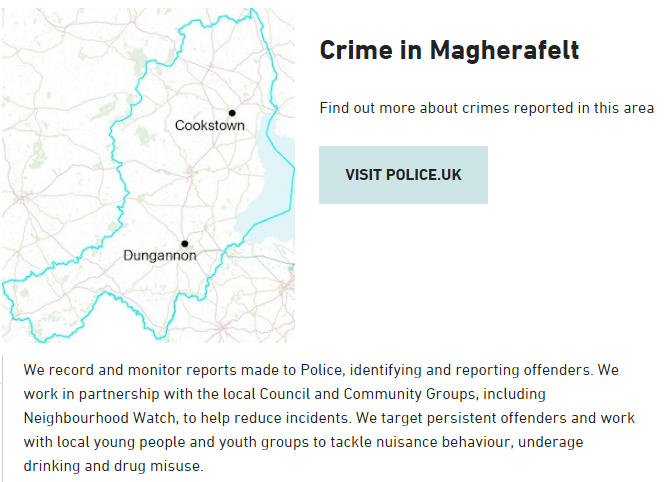 Northern Ireland Commissioner for Children and Young People (NICCY) Koulla Yiasouma said that some of the same children will be recorded across health, crime and education statistics. “It is the same children showing up across these measures,” she said. “For those that appear in hospital or the criminal justice system they are more likely to be from a socially deprived area, they are more likely to have higher mental ill-health and as a result are likely to have not done very well at school. “These are very often the same children who are excluded from school. The children who misuse alcohol are often the children who appear in our criminal justice system. While the majority of today’s figures relate to the immediate impacts of underage drinking, Pat McGinn of Cuan Mhuire addiction clinic in Newry sees a longer-term impact. “I work with the younger residents coming in and most of them are telling us that they began to drink when they were 14 or 15,” he said. “Lots of people are drinking at that age, but they are doing so within parameters, they are working out their limits and they are not drinking until they are blacking out. A lot of younger people I am dealing with think blacking out and not remembering is a normal part of it. It shouldn’t be a normal part. “We have approximately 400 admissions a year – but we would find that there is a steady growth in younger people. Most of them are starting at the age of 14-15. To read Pat McGinn’s full interview, including details of the impact alcohol had on his own life, click here. Although it is a common belief that it is illegal for under-18s to consume alcohol, the law is slightly more complicated. According to government wesbite NI Direct: “Anyone under the age of 18 is not allowed in any bar area of licensed premises or registered clubs. “Anyone under 18 is not allowed to purchase alcohol or consume alcohol in a place other than a private house under the Licensing (NI) Order 1996. Around 2,700 premises are currently licensed to sell alcohol in Northern Ireland. These include traditional pubs, hotels, restaurants and off-licenses. According to HMRC, tax takings from the sale of alcohol totalled £340million in 2015/16, with the hospitality industry estimated to be worth £1.2billion each year. The report does not provide an estimated value of these activities. Historically, the overwhelming majority of alcohol licences were used to run public houses. And whilst this sector remains the largest in terms of licences held, in recent years huge numbers of licences have transferred to off-sales. This stark change in the way the product is retailed has fuelled concerns that it is easier than ever for young people to access alcohol by way of proxy purchasing. This is where an adult purchases alcohol on behalf of someone who would not be permitted to buy it themselves. According to Colin Neill of Hospitality Ulster, loss-leading offers in supermarkets that encourage bulk buying mean that alcohol is more readily available in the home than it was in the past. “If you look at the consumption of alcohol, 80% is consumed at home or on our streets,” he said. “There has been a relentless number of closures (of pubs). It is hard to tie it in with the decade but if you consider that we started off some time ago with 3,000 pubs and we are down now to 1,309. Last week Detail Data found supermarket prices on well known beers for as little as £1.52 a litre. The same quantity of the same beer in a Belfast pub costs more than £6. Detail Data asked the NI Courts and Tribunals Service for a list of all licence holders, the type of premises they operate and their location with a view to correlating the location of licensed premises with courts, police and health data. In its response, Courts Service confirmed that although the information can be accessed, to do so we would have to pay a fee of £22 in each of the Petty Sessions districts, in addition to further payments of £10 to make copies of relevant information. Similar charges would be applicable to view and make copies of club licence information. As such, the cost of acquiring the full list of licensed premises at any point in time would be in excess of £1,000. Detail Data asked the PSNI if it had access to a full list of premises licensed to sell alcohol. Children’s Commissioner Koulla Yiasouma believes this is information that the police should have. “I would expect the police to know where every licensed premises is and to match that against evidence of problem drinking in that area,” she said. In each of its 11 new districts, the PSNI identifies tackling underage drinking as a priority. The PSNI's website shows its priorities in Mid Ulster. A commitment to tackle underage drinking is made in each of the 11 policing districts. However, despite having the power to conduct test-purchasing exercises in a bid to identify retailers selling alcohol to under 18s, the PSNI does not currently carry out such operations. Test purchasing would see under 18s, working with the PSNI, enter licensed premises and attempt to purchase alcohol. The introduction of test purchasing is something the Children’s Commissioner is opposed to. “Young people say they do not get their alcohol directly from the licensee,” she said. One avenue for tackling the problem the PSNI does pursue is the seizure of alcohol from underage individuals. Using the Freedom of Information Act, Detail Data requested figures from the PSNI relating to the number and location of alcohol seizures from Under 18s for the two year period straddling the establishment of the 11 new policing districts. These 11 districts, which mirror the newly formed council boundaries, replaced the old seven district model. Although the new districts were introduced in April 2015, it wasn’t until September of that year that the police began recording alcohol seizures from under 18s using this measure. Analysis of the information provided reveals that the number of seizures recorded in the 10 month period after the PSNI began recording data under the new 11 district model (14 September 2015-23 July 2016) was less than half of that recorded in the corresponding period a year earlier. In the period following the change, a total of 327 seizures were recorded. This compares with 723 in the same period a year earlier. According to Joe Hyland of SOS NI, there is little evidence to suggest that young people are drinking less. “The fact is, if we take the police out of the situation completely and we ask ourselves have young people changed? The answer to that is absolutely not, we haven’t changed for millennia so we aren’t going to change in a few months,” he said. “We then need to ask ourselves has the environment changed. Has alcohol become more difficult to access? The answer to that again is no, not in any regard. “In the last 10 months in the entertainment events side we would have encountered something like 400 young people. And of those, probably a good 60%-70% would have been underage." Detail Data asked the PSNI why the number of seizures had dropped so dramatically, with a response instead highlighting educational work it conducts. “Tackling antisocial behaviour is a priority for police and part of our commitment to addressing this is working with young people to educate them about the dangers and consequences associated with alcohol,” a spokesperson said. “While it is difficult to account for every seizure made, workshops with youth groups, educational visits and presentations in schools and discussion and conversation with young people through the course of police patrols all contribute to the preventative measures PSNI are employing. In addition to a decline in the number of seizures, there has also been considerable variance in the number of premises that have been subject to prosecution and/or conviction for breaches of their licence relating to minors. DOJ provided Detail Data with figures showing that between 2011 and 2015 a total of 153 premises have been prosecuted yielding 57 convictions. The figures for prosecutions vary from just four in 2014 to 96 in 2015. Conviction rates also vary, from three in 2014 to 18 in 2011. DOJ said that it does not record detail on the business type of the defendant in cases relating to breaches of liquor licences. Among the proposals put forward by the community and voluntary sector for tackling the problem of underage drinking is the introduction of minimum pricing per unit. This is a measure that Koulla Yiasouma supports. “All the evidence demonstrates that in countries where minimum pricing for alcohol has been introduced, problem drinking such as binge drinking reduces and hospital admissions reduce,” she said. In 2012 the then Health Minister Edwin Poots said he hoped to introduce minimum pricing by 2013. Since then progress on the proposal has stalled. However, Michelle O’Neill has told Detail Data that minimum pricing remains a favoured option. “Work on minimum unit pricing for alcohol had been paused while awaiting the outcome of a legal challenge brought against the measure in Scotland by the Scotch Whisky Association,” she said. “Following the recent ruling in Scotland in favour of Minimum Unit Pricing, I have considered a range of options and I have concluded that this measure has the potential to greatly reduce the harm related to alcohol misuse in the North. In addition to minimum pricing, Joe Hyland (SOSNI) believes it should be compulsory for event organisers to provide welfare services as part of the terms of being granted a license. “The purple guide in the UK (which aims to help event organisers manage health and safety at large scale events) states very clearly that welfare services at events has to be completely separate from security and acute medical because they have their own function and welfare services, in themselves, are highly skilled entities,” he said. “So I think it is really important that separation is understood and event organisers, as part of gaining a license have to engage highly skilled and engaged welfare services. In response, the Department for Communities (DfC) said that although councils were responsible for the issuing of licenses for events it believed welfare provision should be provided. The DfC statement said: “The Department’s revised model terms and conditions indicate that a licensee should ensure that adequate first aid provision is available at all times and should include: (a) having two trained first aiders, clearly identifiable as such, on the premises during the event; (b) having people with paramedic skills on site for large events (in excess of 500 people); and(c) alerting local hospitals before large events. Event organisers can also play a direct role in addressing alcohol issues. One example of this is the ‘It’s about the battle not the bottle’ initiative launched by the Orange Order in 2016 with the aim of reducing the scale of problem drinking in Belfast on the Twelfth of July. Data used in this article can be accessed here. Campaigners have demanded government action to tackle dangerous levels of alcohol use among under-18s, with calls for the introduction of minimum pricing and legislation to force welfare provisions at large scale events such as concerts. Marie Wright of Start 360, an organisation that provides support to young offenders, said alcohol is a problem for the majority of young people in the juvenile justice system. Historically, the overwhelming majority of alcohol licences were used to run pubs. And while this sector remains the largest in terms of licences held, in recent years huge numbers of licences have transferred to off-sales. The pub industry’s representative body Hospitality Ulster estimates that the number of public houses fell from 1,624 in 1999 to 1,309 in 2015. Over the same period the number of off-sales increased from 360 to 568 in Northern Ireland. In recent years it has also become the norm for supermarkets to sell alcohol, often at prices that fall below the costs of other off-sales and pubs. This stark change in the way the product is retailed has fuelled concerns that it is easier than ever for young people to access alcohol, including by way of proxy purchasing, which is where an adult purchases alcohol on behalf of someone who would not be permitted to buy it themselves. The call for police action comes as new figures obtained using Freedom of Information legislation shows that the number of police seizures has fallen since a recent shake-up in the shape of police districts. The number of police districts was changed from seven to 11 to match the reform of local government in Northern Ireland which created 11 new council areas in 2015. A sample of a ten month period under the old police district structure in 2014 against the corresponding ten month period following the creation of 11 police districts revealed seizures from underage drinkers more than halved from 723 to 320. According to Joe Hyland, the charity’s chief executive, some young people are drinking huge amounts.